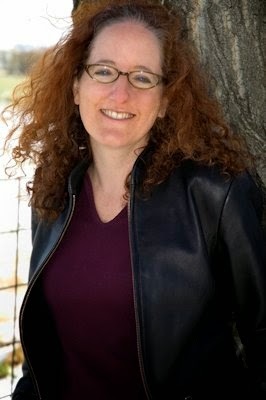 Please welcome Rachel Cantor to The Qwillery as part of the 2014 Debut Author Challenge Interviews. 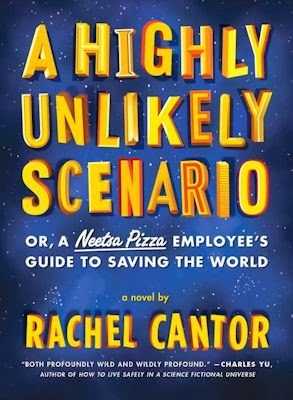 A Highly Unlikely Scenario or, a Neetsa Pizza Employee's Guide to Saving the World was published on January 14, 2014. Rachel: Thank you so much, Sally! I started writing in elementary school, when the sainted Miss Benny plucked a few of us out of our third grade classroom to join her fourth grade creative writing class. My first published work was a Valentine’s poem I wrote that year which appeared in my local newspaper. I won’t say it was a straight line from third grade to publication of my debut novel, but writing is the only thing I’ve ever really wanted to do. Rachel: I love that word—pantser! I’m something of both. 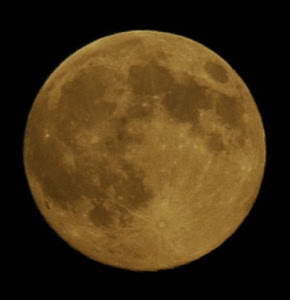 I see my (approximate) destination; in A Highly Unlikely Scenario, the destination (spoiler alert!) was the world saved from certain destruction! I also see an overall structure that helps me get to that destination; in A Highly Unlikely Scenario, I envisioned a three-part structure in which Leonard, my bashful protagonist, makes his way first into the world and then into history. Then I wrote through that structure toward that approximate destination. But I don’t know in advance how I’m going to get there. I plot no more than a few pages ahead and rarely know what’s at the end of each sentence. You have to leave room for the unexpected! Rachel: The most challenging thing about writing for me is dealing with distraction. I don’t just mean the Internet, though that’s possibly the worst of it, but even daily minutia: the phone ringing, the postman arriving, the question of what I’ll cook for dinner. This is why I do my best work at artists’ colonies, where beautiful people take care of our everyday needs, and we’re released to only live in our imaginations. I’ve been blessed to attend a number of them; this book was in large part drafted at the Millay Colony and the Hall Farm Center, which is sadly defunct. But otherwise I write at home, in private—never in public. I can’t know when my writing is going to make me laugh, or cry! Rachel: I read widely and voraciously—literary fiction, speculative fiction/sci fi, mysteries, history. I love long novels and short stories, and I also find inspiration in museums, concerts, films, my friends, walking around a city ... I recently wrote a quick list on Facebook of ten books I couldn’t get out of my mind when I read them—the kind of list you’re not supposed to overthink, noting only the first names that come to mind—and it turns out all were books I’d read before the age of 25: the Narnia series, Jane Eyre, Dante, Italo Calvino, Charlotte’s Web, One Hundred Years of Solitude, Borges. Somehow I forgot Harriet the Spy! TQ: Describe A Highly Unlikely Scenario in 140 characters or less. 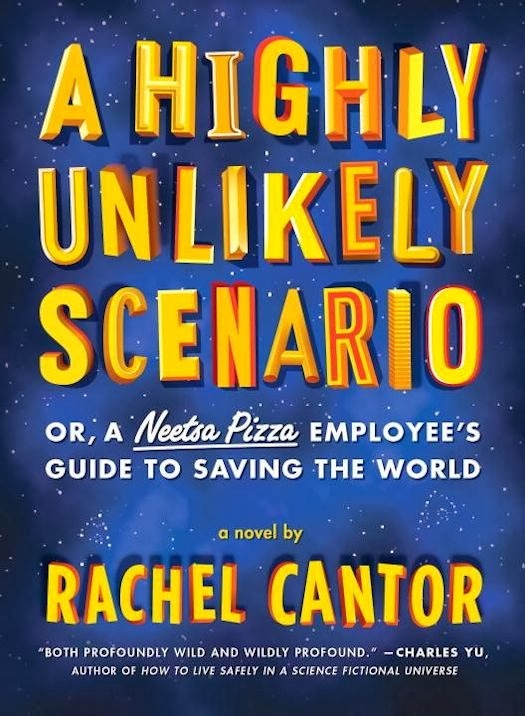 Rachel: It’s a literary romp in which one Neetsa Pizza employee discovers that you can’t save the world with pizza coupons. TQ: Tell us something about A Highly Unlikely Scenario that is not in the book description. Rachel: I love this question! 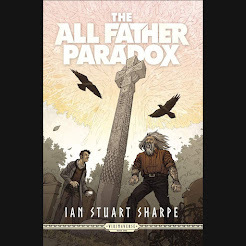 The book is about all of the above, but it’s also about family—about love, guilt, and sacrifice, and also the intergenerational transmission of knowledge, caring, and values. Specifically, it’s about Leonard’s older sister Carol, a neo-Maoist masquerading as a Jacobite, who gave up a music career to care for Leonard; Leonard’s precocious, comic-book-writing, seven-year-old nephew, Felix, who too often is dumped by classmates onto the Municipal Compost Heap; his beloved Sally, a warrior-librarian on a mission to read unreadable manuscripts; and his grandfather, who came from the Old Country and died when Leonard was fifteen, but who’s still a strong presence in Leonard’s memory. TQ: What inspired you to write A Highly Unlikely Scenario? Why did you choose to write genre bending SciFi adventure? Do you want to write in any other genres or sub-genres? Rachel: I grew up in Italy and have always been fascinated by medieval history—its art, architecture, literature, religious movements, and so on. Many of the people Leonard encounters hail from that time, and then, of course, in the final third of the book, Leonard travels to thirteenth-century Rome to retrieve his nephew Felix and, incidentally, to save the world. Writing about these real people was enormous fun for me, as was trying to reconstruct what Rome was like during that time (what did the fish market look like? what might a person have seen crossing the Tiber?). I’m also interested in ideologies, and how they affect our behavior, for better or worse; in this book, religious and political philosophies we consider extinct still thrive (Whigs, for example, and Heraclitans). I’m not good with labels, but only something like sci fi (fantasy? speculative fiction?) could accommodate this much suspension of disbelief, this much imagination. But I see myself mostly as a literary writer; my next novel (due out in January 2015) is a more straightforward literary novel. After that? Who knows! TQ: What sort of research did you do for A Highly Unlikely Scenario? Rachel: I did an enormous amount of research for this book: I read Marco Polo’s Travels, as well as critical writings about his achievements; I looked at ancient maps and medieval engravings; I read about Pythagoreans and medieval mystics and Roman architecture and Jewish life in the Middle Ages and pilgrims’ clothing and the list goes on and on! I’ve created a Goodreads bookshelf of some of the sources that were most important to the writing of this novel. I always do about six times more research than I need—this is the case even with the short stories I’ve written. For me, it’s part of the fun of writing! Rachel: To be truthful, none of the characters in this book was difficult to write: they all felt familiar from the start and I had enormous sympathy for them—all, of course, except the villain Ugolino de Barbarubeis, who chases Leonard around Rome, hoping to hurt him with a brank or a scramasax. He is the only unambiguously bad guy. My favorite good guy is probably Leonard’s grandfather, who doesn’t actually appear in the book, but who ate herring, pored over ancient tomes, and told the young Leonard crazy stories he couldn’t understand. Most of the characters are ethically ambiguous, though: most have made mistakes or have acted thoughtlessly or selfishly at one point, usually hurting someone dear to them as a result. Carol abandons her son to Leonard’s care so she can pursue her revolutionary aims; Leonard’s love interest Sally tries to use Leonard to get information she thinks she needs; Leonard himself was unkind to his grandfather and blind to his sister’s sacrifice. I have a special fondness, though, for Bobolo Savelli, the man who runs the pilgrims’ hostel in Rome. He’s not a bad sort, though he may overcharge Leonard and Sally for the privilege of eating his pottage and sleeping in his flea-ridden bed, but he can’t resist charging admission to see one of the marvels Leonard has brought with him to the thirteenth century, which sends Leonard and Sally fleeing from the Inquisition! TQ: Give us one of your favorite lines from A Highly Unlikely Scenario. Rachel: “Boychik, the old man said. You’re a good egg. I need you to listen good.” To understand what that means, you have to read the book! 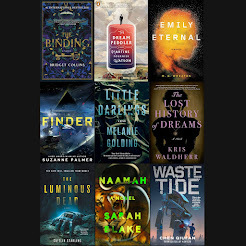 Rachel: I’ll be reading from A Highly Unlikely Scenario on the East Coast, West Coast, and some places in between this year (for dates, folks can refer to my brand new, sparkly website: rachelcantor.com), and working with my publisher to edit the next novel (Door Number Two). But I have a residency planned at an artists’ colony later this year where I hope to write new work. Wish me luck! Rachel: Thank you, Sally! This was terrific fun!